I hope you had a great Memorial Day! We had a pretty good one... Chris's little sister Katy was marching in the parade with her Girl Scouts troupe, so we headed out early to get a seat on the route. After a little while we get a call from Kim saying that the parade has been postponed because of lightning. Well, Chris's dad Bruce is not a fan of parades and made it very clear that he wasn't thrilled to be there, so he decided we should go eat. It's a good thing we did because not even two minutes after we got to the diner it started POURING! I guess in a nearby town they had a microburst and we got some pretty gnarly weather because of it. We had brunch (I got french toast!! ), and while we were there Chris's other sister Lindsey showed up. When we were done, Bruce went to pick up Kim and Katy, and Chris, Lindsey and I went back to their house. We waited around and by the time they got back it was fairly sunny, so we went out on the boat! It was more of a fishing kinda day than swimming and sunning, so... that's what we did! I haven't fished since maybe six years old, so it was frustrating and gross and fun all at the same time for me! 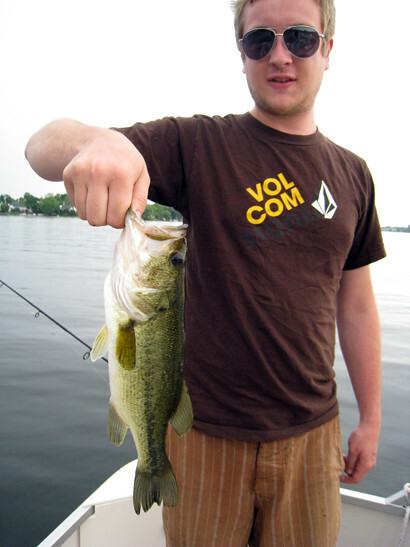 Chris got a bass, one of the bigger ones we've ever seen on this lake! 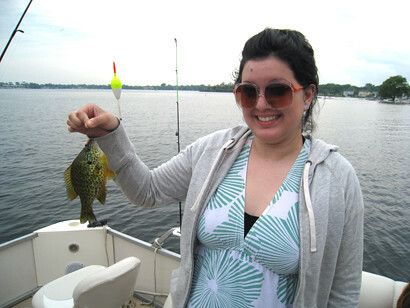 I caught two bluegills! This one was really pretty. Can you tell how excited I am to be holding it?! I've got work this evening, but until then who knows... I think I'll get all gussied up just for the fun of it! haha grody! It's been so long since I've heard that word.... love it! 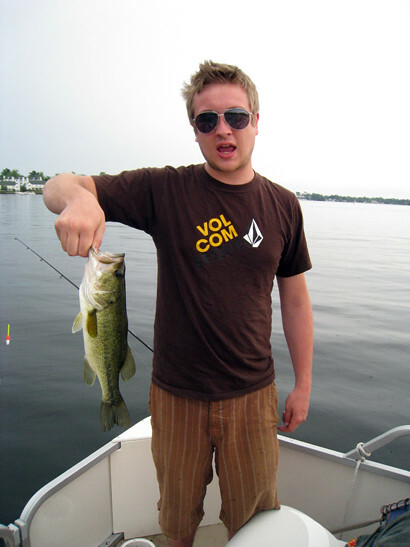 Zach wants to fish a little this summer, but I can't stomach it. I watched my dad cut up and gut so many fish.... maybe one of the many reasons meat grosses me out.